In this episode, one does not simply take a train into the Continent of Darkness. When you want to send out a clear signal that the filler is over and the plot is about to pick up again, there are a few ways to go about it. One is to introduce another benign situation that goes horribly wrong and turns out to be a trap. One is to put a short scene at the end of the last filler episode where the bad guys wake up and do something. Then there's the direct approach where the main characters just fling themselves into Mordor and wait to get jumped. This episode includes all three approaches because after filler that bad, the end of it should be a damn celebration. We kick off the party with the evil Legendary Warriors, who without Grumblemon are proving to be consistently more entertaining than the main cast. The office politics between the four survivors, while simplistic, are more than we've gotten from evil coalitions in the past. When we asked how the Dark Masters managed to work together, it was a rhetorical question. When we ask it about these guys, we can try to piece together an answer. 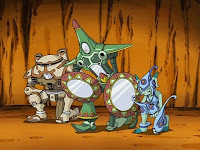 Mercurymon is the master manipulator, preying on Ranamon's insecurity and Arbormon's dimwitted confidence to use them to gauge the digidestined's ability. He also tries keeping Seraphimon's fractal code for himself, which Cherubimon notices but permits... sort of. Cherubimon's presence is welcome, but terribly bland. This deep-throated shadowy figure growls menacing cliches at his minions, but is nice enough to not disrupt the plot with any admonishment for Mercurymon's stunt. No one will accuse Cherubimon of micromanagement. The exchange was sufficiently embarrassing to Mercurymon, however, who's angry despite being allowed to keep the data. It's a good place for Duskmon to stroll in and start the taunting. The cool thing about Duskmon is that nobody seems to like him very much. He's the quiet, kinda creepy co-worker that everybody just sort of tolerates, assuming that the management keeps him around because he's very good at his job... even if he's never seen doing it. Of course, he's the only one who sees right through Mercurymon, so he has that going for him. Grumblemon was Dwight. Even though it's pretty clear that the kids have to go through the Continent of Darkness to get anything accomplished, Bokomon resists, seeing as it's called the Continent of Darkness and all. 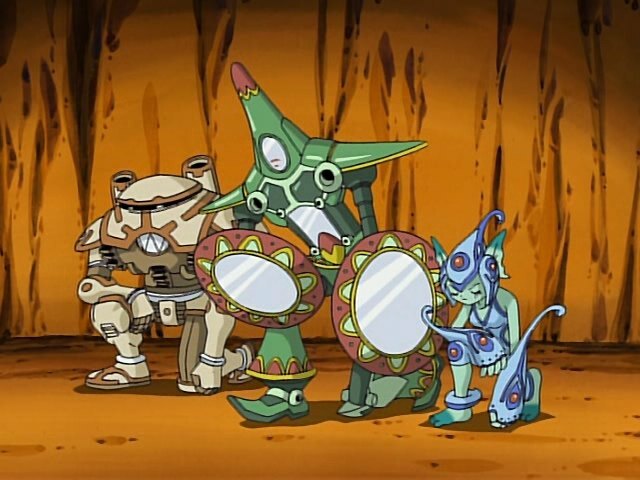 While the kids get that they don't have much of a choice here, it reveals Bokomon as someone who's more interested in hanging out with the Legendary Warriors and dispensing sage advice than actually watching them complete their mission. When faced with mortal peril that the book has no information on, he wants nothing to do with it. The continent is as advertised, dark enough to keep the kids on their toes and make us think something good is about to happen. 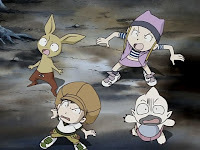 The Pipismon affair is a fair false alarm that gives us some creepy echoes and a surprisingly integrated lesson about the experiences you can get facing your fears. It's the same lesson Cody had in Submarimon's debut, only not tacked on at the last second. It's called out in an annoying fashion, but it's rare to see a legitimate character development moment for Bokomon, so we'll take it. The Petaldramon fight is interesting in the way the villain emphasizes the absorption of data to a ridiculous extreme. While it underscores why Mercurymon was so keen on keeping Seraphimon's data, Petaldramon's ability to absorb the forest and become gigantic sells the idea a little too much. Grumblemon absorbed all sorts of data, but didn't see the rapid growth we see here. While the good guys defeat Petaldramon and take the beast spirit, Duskmon stabs Arbormon in the back and absorbs the rest of his data. Given the significance of the data absorption we just witnessed, it's an understandable move. It also means the kids are probably doomed. Yay! It's Franken! The fact that he's in no mood to enter the Continent of Darkness must mean it's dangerous. Normally, he doesn't seem like the type to care. 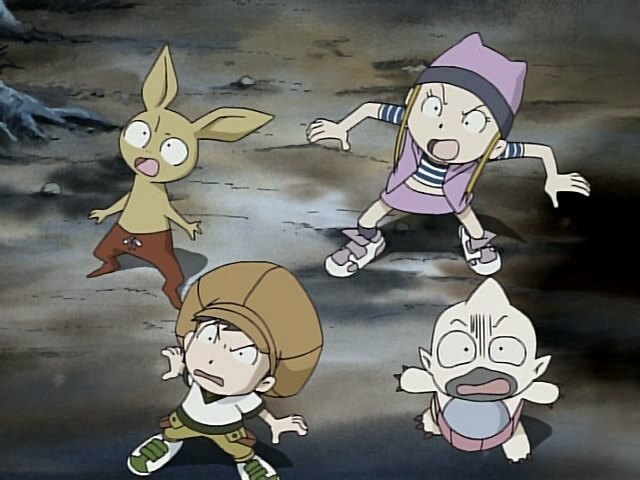 Bokomon's afraid of going through this dark gate, implying that there's another way in that's safer. Where's Gollum when you need him? Is anybody else impressed that all these kids (save JP) are decent at those tongue twisters? While convincing Bokomon to log their adventures in the book, what would have been even more valuable would be killing Bokomon, stealing the book, and designating one of the kids to pull a TK and sign a book deal when all this is over. For once I can complement an action sequence: after discovering that Petaldramon has magically gained the ability to heal injuries, the digidestined turn to grappling moves and attacking uncovered weak points like his tail. BurningGreymon and Zephyrmon also sneak in a double tech attack, which is always good to see. After a complete team effort puts Petaldramon on the mat, Lobomon's free to actually scan him. 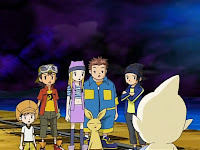 Bokomon's response is not “they” did it, but rather “Lobomon” did it, as if the other four had nothing to do with the win. Good to see I'm not alone in thinking the Evil Legendary Warriors are more entertaining and even likable than our main heroes. (I'll agree that Grumblemon was the weak link amongst them, but I don't dislike him like you seem too. Similarly, I think his good guy counterpart JP has the strongest defined personality amongst his group.) They're some of the best villains in the franchise. They, along with Lucemon, deserved a better series. As did this whole Digital World and it's interesting mythology. I swear, they're on that Dark Continent for a good chunk of the series. It's almost as bad as Dragonball Z and Namek. For about 19 episodes, to be exact, including this one. With 50 episodes in total, that's nearly 40% of the show! The begining was so cool!! I love Mercurymon's "oh crap' face when Cherubimon calls him on his bluff.I really felt what Mercymon felt at that moment,so that was great.I liked Mercymon and Duskmon's convosation. The battle between Giant!Pedaldramon was so entertaining.Liked Takyua and Zoe's combo attack.